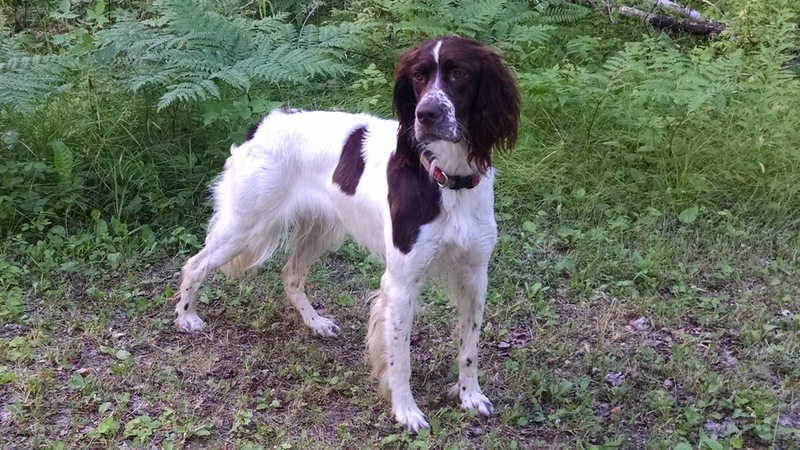 Minnesota French Spaniels is a family operation. 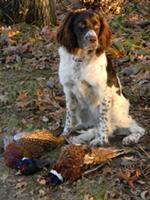 Our number one goal is to produce an outstanding hunting dog and family pet. All of our dogs are proven hunters who have pointed and retrieved hundreds of birds. They have also proven to be loving, loyal members of our family. 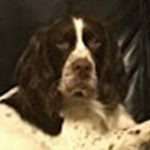 Our dogs represent the French Spaniel in several resource areas including: The Dog Bible, numerous dog websites and have been featured in Spaniel in the Fields and Pointing Dog Journal magazines. We are the longest established French Spaniel kennel in the USA. We have been in business for 18 years. We make every effort to include our clients in the maturation process of their pups by sending weekly digital still shots and video clips over the internet. Pups will be well socialized and started on crate training when you receive them. We will not abandon you once you purchase a dog from us. We will be there to guide and advise you should you need any help. 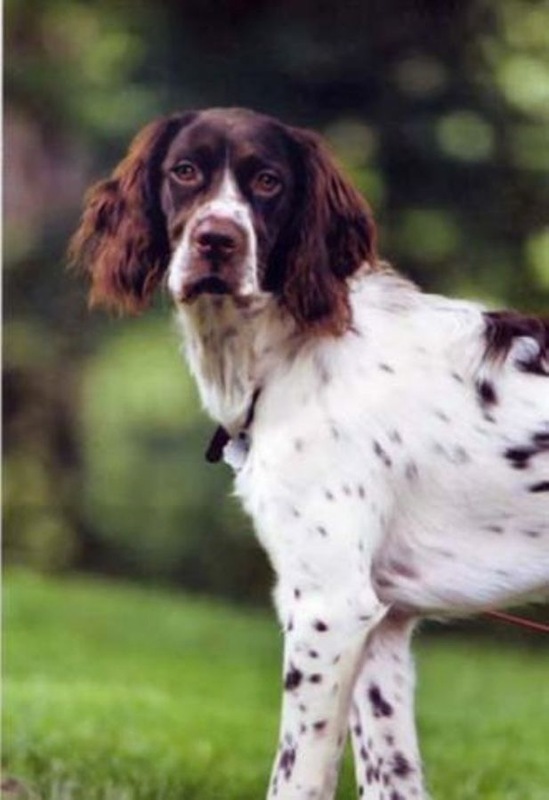 The French Spaniel is a very old breed with documentation of the breed back to the 14th century where it was used for net hunting and falconry. The dog was little known outside of France and neighboring countries until it was introduced in the Canadian providence of Quebec in the 1970’s. 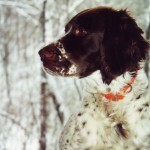 It quickly became a popular dog for hunting woodcock and grouse. The Canadians formed a strong breed club to ensure the French Spaniel would continue to meet breed standards. In 1985 the French Spaniel received CKC or Canadian Kennel Club recognition. 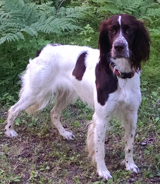 The French Spaniel is a true versatile or multipurpose hunting dog that will pursue, point, track and retrieve game on land or water but like most pointing breeds, the French Spaniel’s true strength is hunting in fields and forests. The French Spaniel is a medium to close working pointing dog that works at a very comfortable pace. His gait has been referred to as a trotting or easy gliding style. They are a tough, determined dog that can adapt to all types of terrain. The French Spaniel is one of the largest spaniel breeds that might best be described as a dog with spaniel features and a setter-like body. The hair is medium long and wavy on the ears, backs of the legs and tail. It has some waviness on the chest and otherwise lies flat on the body. Their coat serves them well in cold weather or icy waters. They can range in height from 21 to 24 inches. Range in weight is 50 to 60 pounds. The French Spaniel is a calm, loving, intelligent family dog. The French Spaniel will work hard to please its owner but it doesn’t take to heavy handed treatment. It should be in a home that will give it lots of attention and allow it plenty of exercise.